As mentioned at the beginning of this chapter, modern medicine is adapting and beginning to reincorporate some of the ancient wisdoms we have explored into its practices. In part due to the influence of holistic practices. These practices are quite different from modern medicine. They promote health prevention instead of intervention and try to understand all the factors operating on a person’s life. As such it is a highly personalized and pluralistic approach to health, which takes into account diversity of life experiences. 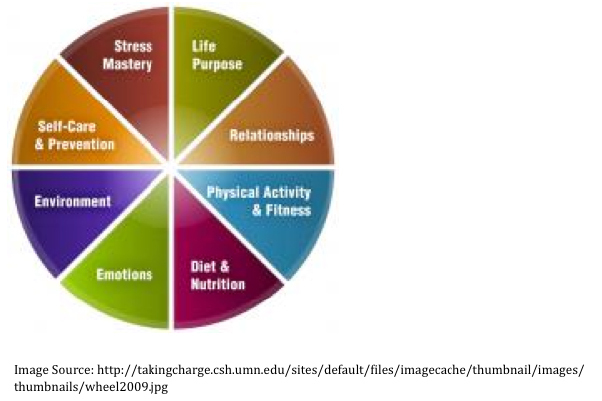 Dr. Mary Jo Kreitzer, Director of the Center for Spirituality and Healing, at the University of Minnesota, identified six dimensions that contribute to wellbeing. These take into account our interconnectedness and interdependence with our friends, families, and communities, as well as the personal and global environment we live in. They also address the importance of security and purpose in our lives, which often associated with a connection to spirituality. The influence of ancient traditions is clear, but the wheel of medicine has been transformed into a wheel of well-being that integrates many of the elements we discussed in this chapter, as seen in the figure below. Holistic practitioners attempt to understand many aspects of people’s needs: nutritional, emotional, physical, social and spiritual. Holistic practices acknowledge that all these aspects operate as one inter-penetrating and co-operative system. What affects one area affects the others, and being aware of how this happens will help a great deal in achieving a wholesome balance. “The body exists in a state of constant change and movement. There is an internal balance, known as homeostasis, which is constantly monitored and maintained. This is the Western way of explaining what the Chinese call ‘yin and yang’: the complementary opposites which in life are always moving and dancing together in and out of balance (although in Western physiology, homeostasis relates to physical functions only). Here is an important clue to stabilizing the symptoms of sensory overload; working to understand the nature of the energy that highly sensitive children sense may help them learn to work with it as a communication tool instead of a disruptive sensory input. This means being able to discern the characteristics of the energies that they sense. Holistic health modalities acknowledge the complexity of health and are much more suited to understand highly sensitive people health than the western systems of thought. But one element these modalities do not yet address is the impact of communication technologies on us. While this can be challenging, it is essential to a highly sensitive person as the quality of space and the energy it carries have changed by our use of communication technologies. [i] Waller, Pip (2010). Holistic Anatomy. An integrated guide to the human body. North Atlantic Books: Berkeley, California.